European culture in the seventeenth and eighteenth centuries witnessed a radical redefinition of ‘humanity’ and its place in the environment, together with a new understanding of animals and their relation to humans. In examining the dynamics of animal-human relations as embodied in the literature, art, farming practices, natural history, religion and philosophy of this period, leading experts explore the roots of much current thinking on interspecies morality and animal welfare. The animal-human relationship challenged not only disciplinary boundaries – between poetry and science, art and animal husbandry, natural history and fiction – but also the basic assumptions of human intellectual and cultural activity, expression, and self-perception. This is specifically apparent in the re-evaluation of sentiment and sensibility, which constitutes a major theme of this chronologically organised volume. 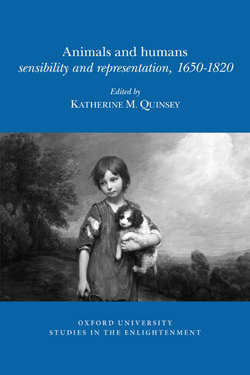 Authors engage with contemporary reactions to the commodification of animals during the period of British imperialism, tracing how eighteenth-century ecological consciousness and notions of animal identity and welfare emerged from earlier, traditional models of the cosmos, and reassessing late eighteenth-century poetic representations of the sentimental encounter with the animal other. They show how human experience was no longer viewed as an iterative process but as one continually shaped by the other. In concluding chapters authors highlight the political resonances of the animal-human relationship as it was used both to represent and to redress the injustices between humans as well as between humans and animals. Through a multifaceted study of eighteenth-century European culture, authors reveal how the animal presence – both real and imagined – forces a different reading not only of texts but also of society. Parution de la Voltaire Foundation, dans la collection des Oxford University Studies in the Enlightenment.